We’ve got friends currently touring Banff and now your post surely shows that it’s a place I should visit as well. What’s up with the coloring of Bow Lake? Do you know anything about it? We visited the town of Banff just once, finding it touristy and not all that interesting per se. Banff National Park, on the other hand, brings one natural wonder after another. So you trundled off to Rundle to begin the day: and a fine one it was. Of course I like the fireweed, with its resemblance to Clematis drummondii, and the reflective lake, and the cloud-shrouded peak, but that photo of the burned trees is a show-stopper. 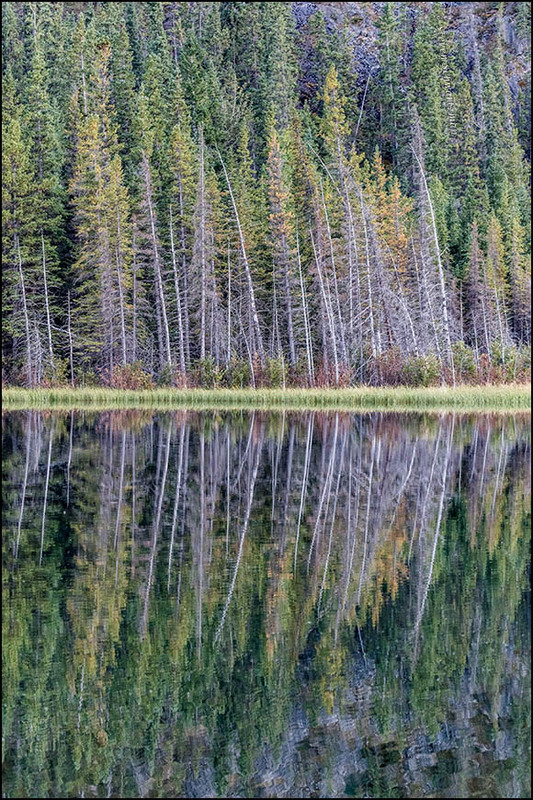 It brings to mind the Group of Seven, particularly Lawren Harris when he was painting those wonderful abstractions, or perhaps Lawren Harris crossed with Ansel Adams. The colors are so unusual, especially the shades of lavender, and the ‘V’ of the angled trunks helps to keep it from feeling static. Sometimes we can’t see the trees for the forest, but in this case, the trees demand to be seen. The day did indeed see us bundle off to Rundle, whose name I had to track down once we arrived back home. Will we now also shuffle off to Buffalo? And alas for poor Calgary, which has no rhyming pal, not even Palgary. Interesting that the close view of burned trees stood out for you. I wonder if that’s because pictures at least a little similar to the other four appeared here last fall, thereby taking some of the edge off the current ones. 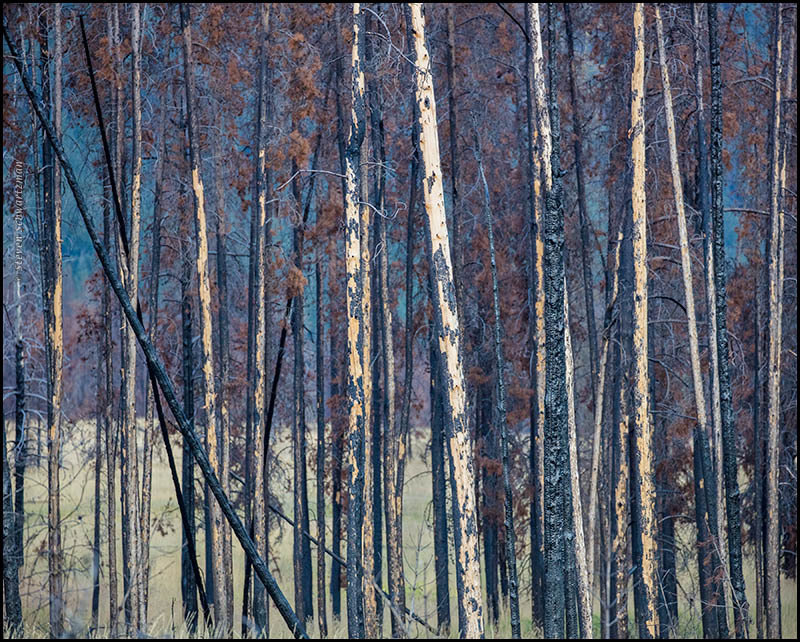 In any case, I like your analysis of the burned-trees picture, especially the comment about the burned trunks not appearing static. As for the Group of Seven, we saw more of their work at the Art Gallery [i.e. Museum] of Nova Scotia in Halifax on our recent trip to that side of Canada. I’d love to see even more. This is a top-notch album this morning, or top-peak I guess is more appropriate. 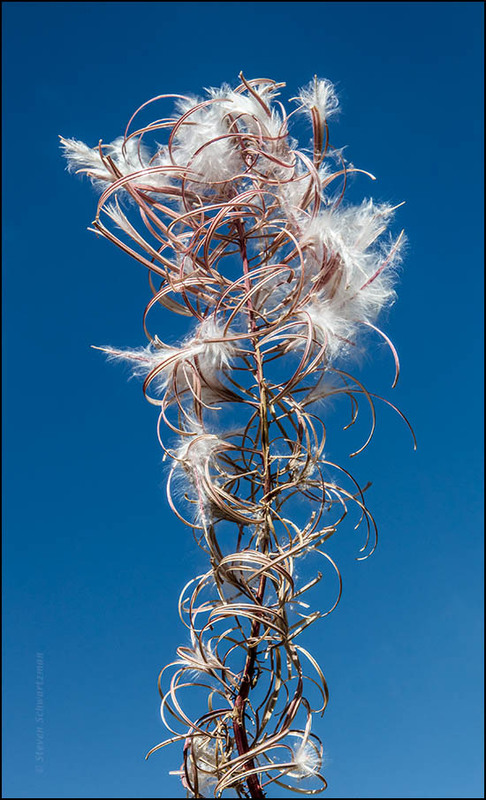 The fireweed looks like it decided to go out with a bang, very festive-looking. Your use of “top-notch” made me wonder whether you visited New Hampshire’s Franconia Notch during your recent stay in relatively close Boston. Visiting the Canadian Rockies was definitely a peak experience, as you glimpsed here and as I’ll show in several more posts over the next week. How was it that I waited so long before finally setting foot there? I’ve driven through the Notch, going to and from Montreal or Quebec City, but usually at night, and never had time to explore that area. I like “fiesta” as a verb, and “party” has certainly become frequently used that way. Fare thee well, fairs! Sounds like you should go to Franconia in daylight so you can put another notch in your belt of places visited. Speaking of fare as a verb, it seems to have suffered a decline in usage. The second example given in the American Heritage Dictionary strikes me as old-fashioned: “How does it fare with you?” Likewise for the interjection farewell. Maybe I’ll follow your lead and start a campaign to use those words to a fare-thee-well. Sorry to hear about the belt-tightening. At least tight belt rhymes with svelte. Like you, I noticed that fare as a noun is more common than as a verb. In addition to tavern fare there’s the fare someone pays to ride the subway. Those colors at Bow Lake are amazing. It would be a good place for a family reunion. It is spectacular, and it’s in your general part of the world. Might a trip north be in your future? These shots are all exceptional!! I am afraid I cannot choose a favorite – they all have a special appeal. Picking a favorite’s not required, Lori: there’s no extra charge for liking more than 1. If anything, this can be an incentive to visit that superscenic region. When FD retires we hope to do a lot of traveling. Meanwhile, it’s wonderful to take note of the places we’d like to see. Your travel and photography gives us lots of great options! There is a lot to see down in Texas that we haven’t explored yet! While Texas is nowhere near as spectacular as the Canadian Rockies, it has the advantage of being a lot closer to you. If you drive west to the panhandle of Texas, you can visit Palo Duro Canyon and Caprock Canyons. The Trans-Pecos region also has worthy scenery, including of course Big Bend National Park. Wonderful pictures. Some of them look like drawings. Perfect! Thanks, and let’s add that Hikeminded is likeminded about the beauty of the Canadian Rockies. Everyone should visit that area. Then so much the better: you’d see different-looking places. 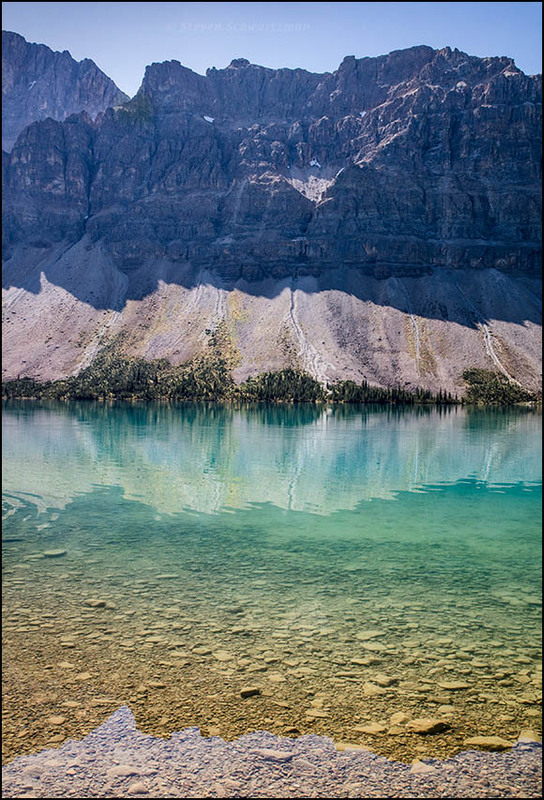 All are fine images, but the color palette of Bow Lake is exceptional. I believe there are more than one lake in Alberta with the rock flour effect. Right you are. We saw several lakes that exhibited the rock flour effect, with the most saturated color probably coming from Peyto Lake. To see it you have to hike up a ways, unlike Bow Lake, which is immediately visible from the highway. I was trying to remember Peyto Lake. I used to see many images from there on Naturescapes. Yes, I remember that image and our exchange. If I may be so silly; I was struck by the fact that you chose 5 photos, which flowed (roughly) from mountain peak to ground/water level. The sequence made me think of Maslow’s Hierarchy of Needs which is expressed in a pyramid shape. Now here is’ the silly’ ~ Mt Rundle, I can equate to the peak, or the achievement of full potential; the late stage fireweed represents accomplishment in a life cycle; the third photo which beautifully portrays layers seeping into each other can be seen as belonging/relationship; the 4th scene works perfectly as a representation of safety, or the need for safety; and lastly, the trees (living and dead) and the water symbolize basic needs, water, food, warmth, and rest; the foundation for everything. How did I fare with that analysis? My daughter is threatening to do a similar over analysis with one of my poems. Seriously, the photos are lovely and I do like the way you have presented them. Someone was definitely in an analytical mood yesterday evening (NZ time). The matching was cleverly done. Did your daughter’s would-be analysis of your poem come not long before and put you in this frame of mind? Something that I read recently mentioned Maslow’s hierarchy. That was the first reference to it I’d come across in a long time. Unfortunately I don’t remember which article or book I encountered it in, or why it was being brought up. In any event, I’m glad you liked the photos and their presentation. I certainly was excited to see these sights and have a chance to record them. Indeed, my daughter’s analysis of my poem came a few days ago. I, too, had not thought of Maslow’s hierarchy in a long time. It reminds me of Lake Wakatipu.